Quite symbolically, it seems that Shraddha has played a pivotal role in Sudha’s life right from a tender age. 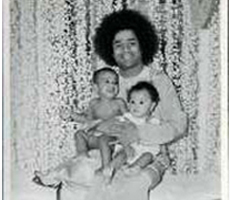 Having virtually lost life during a journey with her parents, she was rejuvenated by none other than Sri Jodi Adipalli Somappa, an incarnation of Bhagwan Sri Sathya Sai Baba. The Shraddha of her parents, their conviction that the Lord is always there to protect and guide the family, is what has resulted in their experiencing the miracle of life. This divine incident has gone down in the annals of history and is featured in the Sai Satcharitha. It is always with moist eyes that Sudha speaks of the miracle by Bhagwan in His incarnation of Sri Jodi Adipalli Somappa, where she was too young to understand or experience the magnitude of this divine intervention. She could only revel upon it when it was retold by her parents many years later, when they felt their child would be able to comprehend it in the manner it was meant to be. Details of this divine miracle can be viewed in the following link. Sudha performed at Prashanthi Nilayam during the occasion of the Bheema Ratha Shanthi ritual on 10th February 2005. She was blessed abundantly by Swami. She regaled the gathering with selections of Sriman Narayana, Brochevaarevarura, Sita Kalyana Vaibhogame, Jagadodarana, Korai Onrum Illai, Pyare Darsana Deejo, Bho Shambho Shiva Shambho Svayam Bho, More To Giridhara Gopala Dusaro Na Koi and Man Ki Ankhein Kholo Sairam. “When she sang songs 4 and 6, it was wonderful to see Swami also singing along with her. In fact, song 6 which is a Meera Bhajan was very lucky to have the Lord singing it fully line after line! The song on Swami, praying Him to open the eyes of our minds was a befitting close to the day’s program. For was this not the true purpose of all our endeavors in life? The song ended with fast beats that found all the devotees clapping along with the song. Swami stood up and was swaying to the beat. 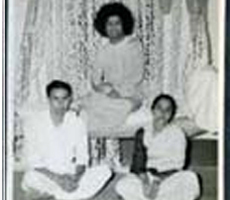 Our hearts too were swaying to the melodious rhythm and beat.” …an excerpt from the Sai News. Sudha was fortunate and blessed to sing on the occasion of the 85th birthday of Bhagavan at Puttaparthi. Her concert was on 19th November, singing at his feet and blessed generously.